Last Thanksgiving saw the Omega come and the Tutima go. The Explorer came in early 2018. Both of them have received the vast majority of my wrist time. Still unsure what I will do with the JLC (not wearing it), Ball is the beater/travel watch (I don't care if it gets trashed), and the Archimede is my first mechanical watch that started it all and no reason to ever get rid of it. The Dornblueth & Sohn Calibre 99.1 might very likely be my next piece, and a Sub or Sub Date is also likely. There are a lot of watches I like, they just all tend to be 'just out of reach'. I would say keel the JLC. It is a nice high end watch that you might miss if you sell, I am a JLC fan though. I'll also suggest keeping the JLC. It will last forever and everybody needs a dressy piece on occasion. You must prefer darker/black dial. Perhaps sell the JLC if you aren't wearing it to help fund your next piece(s). if you let go of the JLC (I would too if I weren't wearing it) a white dialed Dornblüth would be a good one to fill that slot in your collection. 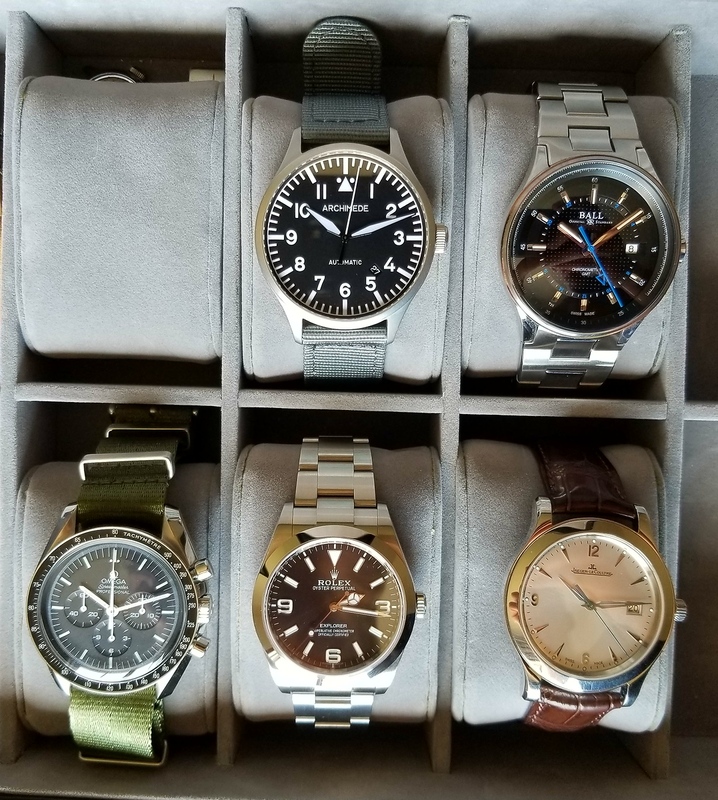 Nice collection, I like the Archimede. I could see myself with one someday. Nothing exciting under the pillow, some old thrift store things (department store stuff). Very nice collection, love the diversity. Nice collection right there, thanks for sharing. well selected ... have fun with them. Nicely selected, I see a pattern here. Previous Topic: Frank the factotum finds my old stopwatch in building basement.